*This post is sponsored by The Home Depot and Kreg Tool. I have been compensated for my time and provided with product or payment in exchange. All opinions are my own. This post contains affiliate links. 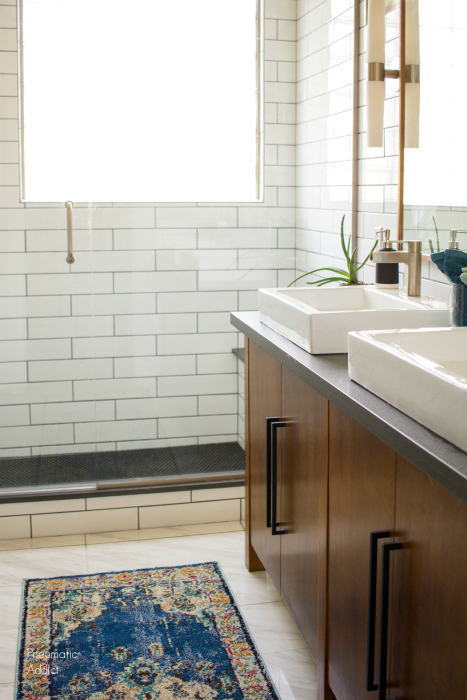 I have been up to my eyeballs in a bathroom remodel friends! Like most big projects, it's taken us much longer than expected. Back in October I shared the before photos and my design inspiration. My husband and I have done all the work ourselves, which means we've had to squeeze work hours into nights and weekends. The first step was to demo the old shower, tub, and linen closet to make way for a new water closet (little room for the toilet) and a large walk-in shower. Although it's not very glamorous, it actually went very quickly. Check out the demo process here. Progress slowed to a snail's pace once the shower install started. I've shared with you guys many times my great hatred for installing tile. It's even worse than hanging drywall (and that's really saying something). Give me some wood or a paint gun and I'm a happy woman! Tile just ain't my thing. I have the utmost respect for tile guys who do that backbreaking work day in and day out. Back when I was finishing up my kitchen, I told you guys to never let me touch tile again, but after getting a $2,500 estimate, I knew I was going to have to roll up my sleeves. Anyhoo, the shower is finally done and it's awesome! Don't worry, I've be sharing the reveal very soon. In the meantime, I got back in my comfort zone and finally did some woodworking! The original vanity probably looks exactly like your bathroom vanity if you live in a tract home from the 90's or early 2000's. Golden oak with a cultured marble countertop. Although I loved the size, the boxy design had room for improvement. Our bathroom is decent sized, but it's not large. Creating a cabinet that has legs and is open underneath will hopefully make the area seem more open. 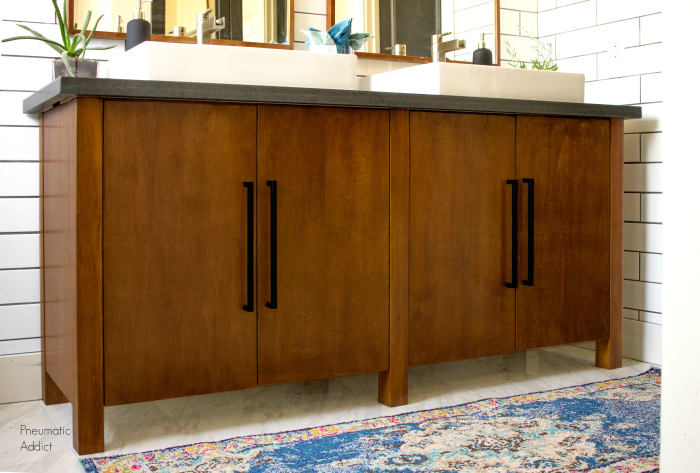 I think there is beauty in simplicity, so I gave my design large, smooth, flat panel doors. 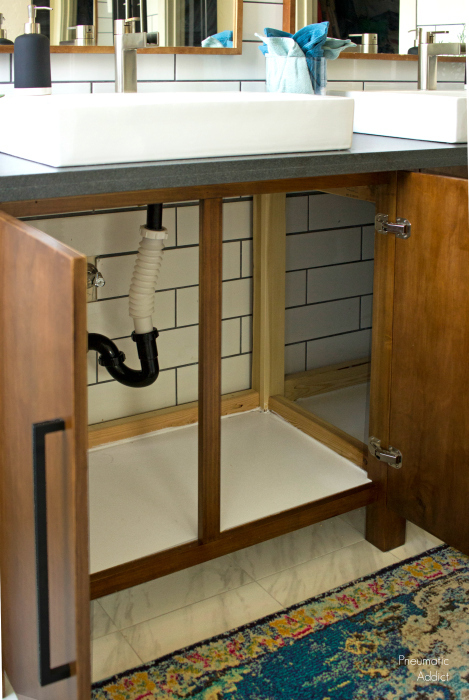 I originally thought I would go with all drawers instead, but decided I wanted the flexibility of a large open space under the sink. I can add pull-out shelves down the road if I like. I've shared the FULL BUILDING PLANS over at BuildSomething.com for you to reference, but in the meantime I want to talk to you about the actual building process. First, I want to express my undying love for pocket holes. Yes, I have tried other traditional joinery techniques, like when I used dowels on my Three Leg End Table or on my Floating Top Console Table, but I keep coming back to my pocket hole jig. You will have to pry my jig out of my cold dead hands. *If you are one of those judgey, "real" woodworkers who looks down your nose at pocket holes, save your breath. I make beautiful things that people actually use and I sometimes rely on those pocket holes you are so superior to. If that's not pretentious enough for you, go comb your beard and make your jewelry box elseware. In my experience with pocket holes, I've discovered two things are essential (besides a Kreg Jig). You absolutely need a good drill and impact driver. Do you really need both? Yes. Yes you do. 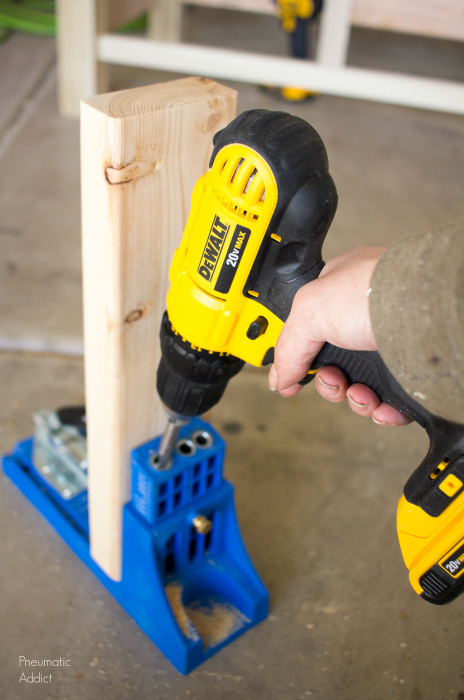 The stepped drill bit used with the Kreg system is designed to be used with a drill. Depending on the material you are drilling into, you may need to adjust your speed or torque. 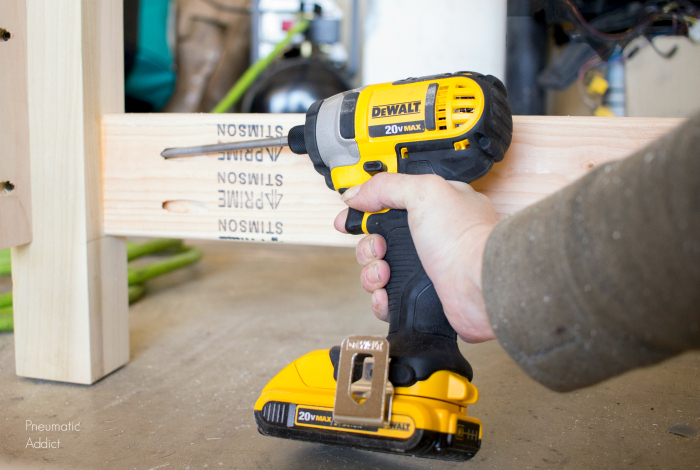 The DeWalt 20 Volt Max Drill allows you to do that easily, and the 1/2" chuck (part that holds the bit) will easily accommodate a larger drill bit. Since pocket holes are typically designed to be used with self-tapping screws, you don't pre-drill into the piece you are attaching to. 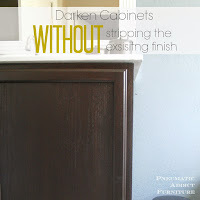 This can make things a little tricky, especially if you are using a hardwood like I did with the vanity's poplar frame. Simply put, sometimes it takes some muscle to get that screw to really bite in. 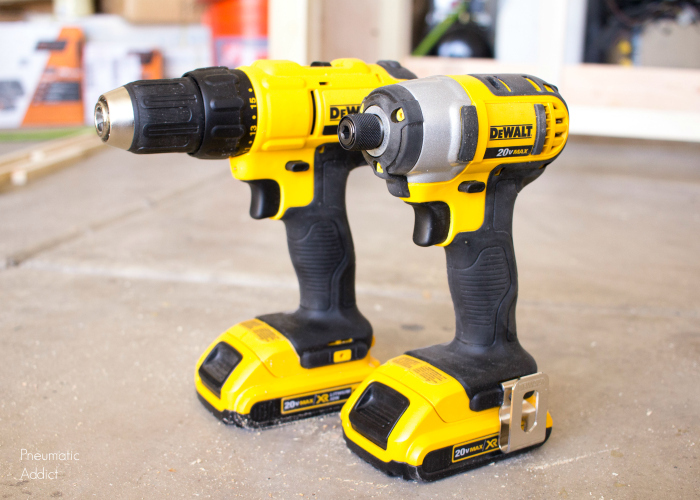 This is when you will fall in love with a cordless impact driver. I explain more about the difference between an impact driver and a drill in this Talkin' Tools blog post. Not only are drills and impacts better at specific functions, you REALLY don't want to hassle with constantly switching back and forth between a drill bit and a driver bit. It gets old really fast! If you plan to do much building, I strongly recommend you invest in a drill/driver combo kit, like my 20 Volt Max set from DeWalt. It even comes with a charger and two batteries (which can get expensive). So back to talking about the vanity build. Since my doors were flat slabs, I knew the finish would have to be perfect or they would just look like cheap pieces of plywood. I followed the same steps I always do, like in my "Stain Like a Pro" video, but with one new exception. It seemed to work out perfectly! I can't wait to tell you guys about it. I'll be writing up a full blog post about my new trick and giving you guys the deets. 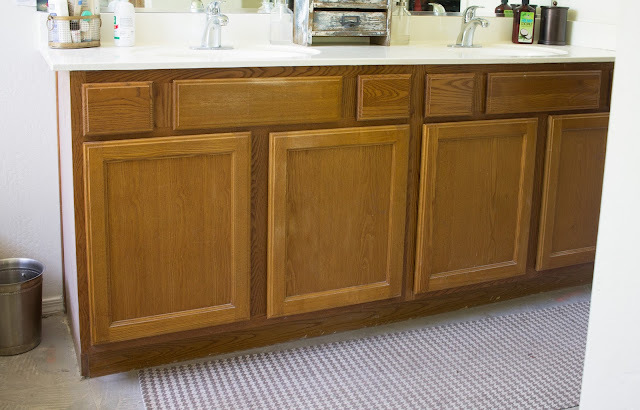 So are you ready to see how my new double vanity finally turned out?! I love love love it guys! It's exactly how I pictured it. Unlike most stock vanity cabinets, the opening under the sinks goes all the way through. It gives me so much storage space! I've got all sorts of baskets and cubbies to sort my junk and I'm actually kinda excited to organize for the first time in my life. I found a mostly intact slab of granite on Craiglist about a year ago for $100 and it's been chilling on the side of my house ever since. It's honed black, which means it's actually a matte charcoal color. It's some of the prettiest stone I've ever seen! 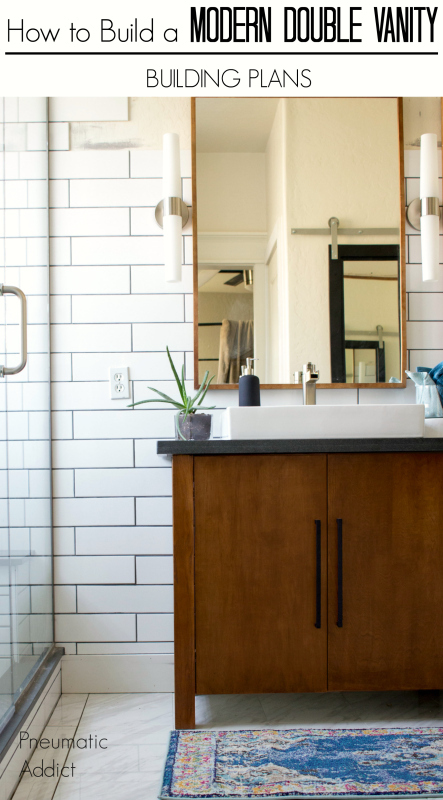 I wanted simple, solid colors in this bathroom and I've always had a soft spot for matte and stain finishes. This is one of the two areas we chose to hire a contractor. 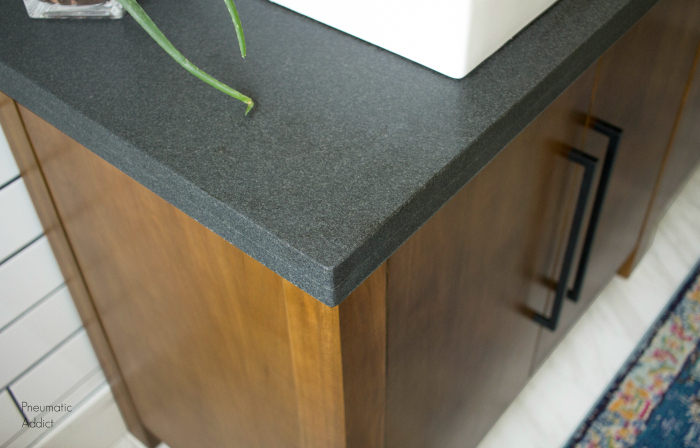 There was no way I was going to risk this gorgeous granite and try to cut it myself. We found someone to cut and fabricate all the pieces we needed. We had enough of the slab to cut a bench seat and threshold for the shower as well. This is probably my favorite Craiglist score I've had. 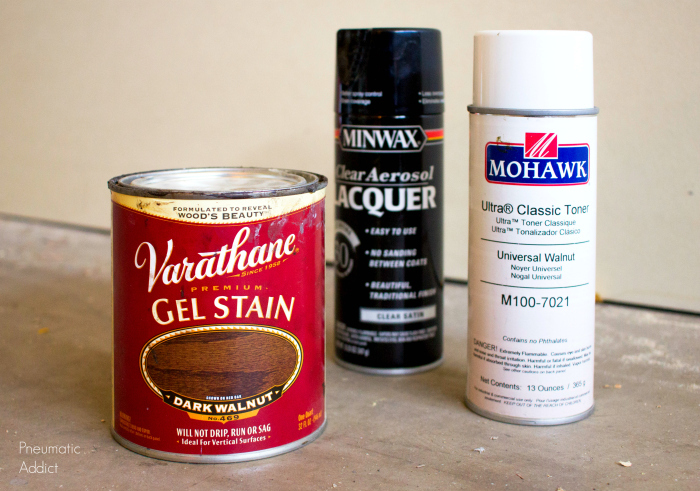 If you know you have a remodel on the horizon, keep an eye out for deals and be willing to stockpile. 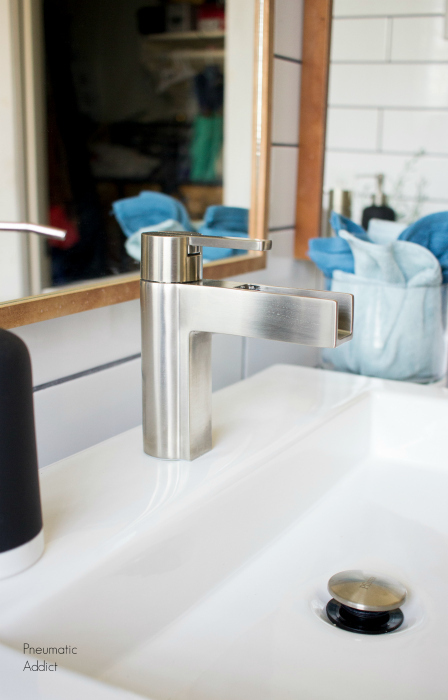 For example, I found the faucets we wanted (Vega in Brushed Nickel by Price Pfister) on a special buy at Home Depot months ago, so I bought them and stashed them under my bed this whole time. 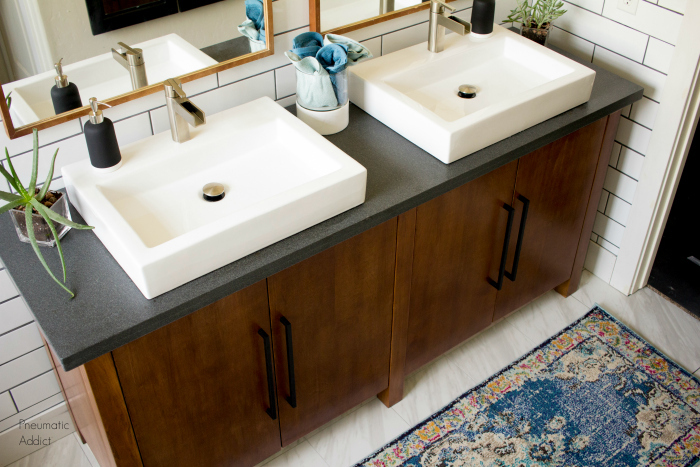 The rectangle vessel sinks, drawer pulls and carpet runner are all from Amazon. I'm really happy with how to stain came out. What do you think? Do they look like cheap slabs of plywood to you? 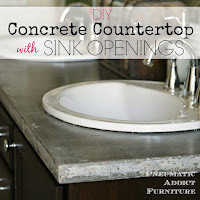 I know the idea of building your own bathroom vanity sounds like a daunting task, especially if you like modern design. Honestly though, this double cabinet was a pretty simple build. Totally DIY friendly. 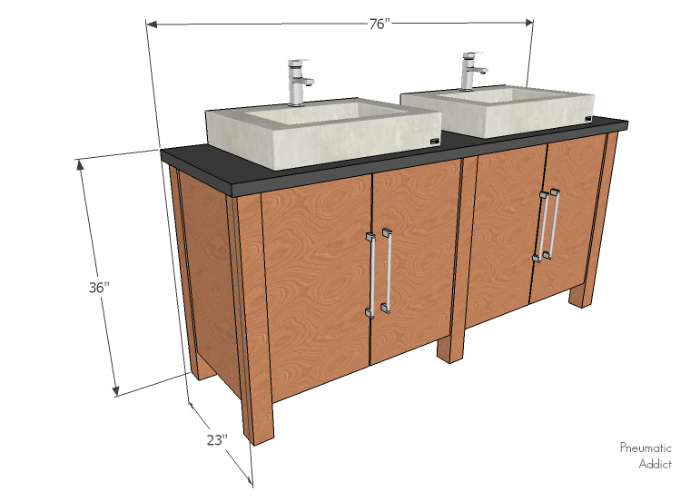 Make sure to head over to BuildSomething.com to get the FULL BUILDING PLANS and materials list.